Sounds like he was in deep. One thing to owe money to a casino that they would work out over time, the $825K to an un-named outsider sounds like they would take his thumbs. Although I'm not a fan I take no joy hearing this news, especially since he is a father of 4 children. However, my guess is alot of the people Carton has thrashed over the air (i.e Francesa, Waldman, etc.) will take great joy when they hear this news. If the initial reports are true, this guy is done. When he gets out of jail he'll be lucky to get a gig in Burger King. I usually caught the last hour of the show on my way in to work. Thought it was a little odd he wasn't there today after just coming off a break. In small doses I could tolerate him, made me laugh sometimes. I figured it was an act mostly as well, with Boomer playing the straight guy. Sounds like he tossed it away which is a shame, but I feel more sorry for the wife and kids. Very sad for his family. If it was a gambling addiction I wouldn't be surprised if he hid it from the wife and kids and his parents. Damn WFAN seems to be a bastion of troubled talks show holds. Wasn't Sid Rosenberg canned for substance abuse? These accusations are crazy. Looks like there is enough evidence to get a conviction. He will be in prison for a long time if he does not settle. His WFAN career is definitely over. Like others have said, I feel terrible for his wife and kids. Their lives were turned upside down overnight. Boomer and Craig appear to be very close and I wonder if Boomer knew the extent of Craig's gambling/personal debts before today. I worked with someone who had a gambling addiction and I can tell you that they will do anything to get their hands on cash to feed their habit. Its a shame. They have the goods on him. His broadcasting career is over. His best course of action is to get his gambling addiction addressed and then try to cut the best deal possible with the Feds. I had given up on FAN years ago. I have better things to do with my life than to listen to that drivel. I wouldn't take a whole lot of joy in seeing someone go down like that. Its obvious the guy has issues. I only started listening through the Tunein app over the last year, so I am not totally up on his history. Either way, for him to go down because of something unrelated to radio is a lot different than saying something stupid on air to get himself fired. If Francesca or anyone openly takes joy in it then it says more about them as a person than anything else. Are there other NY sports talk centric stations in NY with some focus on the Yankees? I generally don't like podcasts, by the time I get to listen to them they are old news. Boomer and Carton were somewhat entertaining and interesting on my way in to work. Its better than the LA stations I can get. Don't really care for Beningo and Roberts, Francesa, and can't stand Summers. I don't disagree with this especially when there are 4 children impacted. But Carton was relentless with his insults and mocking of certain individuals over the years. They won't say it publicly but I'm sure they were some smiles when the news broke this morning. I agree he is going to do time. He should probably enroll in gamblers anonymous ASAP and throw himself at the mercy of the court. Carton was relentless with his insults and mocking of certain individuals over the years. They won't say it publicly but I'm sure they were some smiles when the news broke this morning. Like everybody says, "Be Nice to People on Your Way Up. You’ll Meet Them On Your Way Down"
Last time I listened to terrestrial radio and WFAN, it was the Mike and the Mad Dog Show. (Think 2005). I listen to SiriusXM MLB Home Plate. Not NY centric but as someone not interested in the other sports I don't get stuck listening to football talk in July and no baseball talk other than when signings happen in the off season. The never-ending basketball talk is what drives me crazy. I rely on the apps, and don't have satellite - though when I rent a car I have listened to Home Plate. That's a good alternative, but I like listening to the local shows about my favorite team. Sort of transports me back to my youth In a way I guess. You know it's going to be a bad day when the FBI knocks on your door in the wee hours of the morning. If I'm not mistaken, this is the same obnoxious person who was threatened by Gov. Codey of NJ when Carton was on 101.5. Carton was making fun of Codey's wife who was talking about mental illness. I wish Codey had gotten to him. Why, did WFAN hire him in the first place?? He was a terribly hacky pseudo-shock jock who made fun of women with postpartum depression when he was on the radio in New Jersey. Couldn't have happened to a nicer POS. FA LA LA! LA LA LAAA! LOCK HIM UPPPP! I'll be honest, this Carton thing bums me out. I never really got the hate for him. That said, I didn't know who he was when he was ragging on the woman about post partum depression and the over the top Asian jokes etc...by the time he was on WFAN, he wasn't PC, but basically PG-13 and non offensive. Seemed like he loved his family, loved having a good time, did good charitable work while making it fun and for a while I thought he was pretty funny...his Suzyn Waldman stuff cracked me up along with several of his other things. In recent years, I found myself listening less as he was getting a bit stale, but I liked him still. 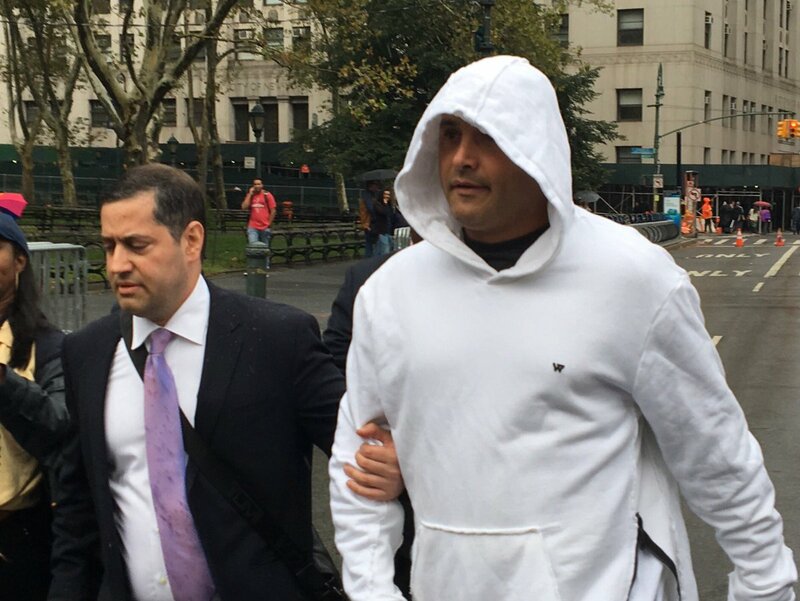 It's unreal that a guy making $2 million a year, rubbing elbows with NYC celebs, with a wife kids and living comfortably in Tribeca could throw it all away gambling and then ripping people off. If it's all true...and certainly it all looks really damning...he deserves every last minute of the jail time he has coming, but it's still sad, imho.